You can create and delete clusters in different regions. You can authorize Container Service to create ECS instances and add them to a cluster, or add existing ECS instances to a cluster. Manages containers in terms of the networks, storage, logging, monitoring, application scheduling, routing, and account permissions. Supports the communication between containers on different servers and high-performance VPC network drives. Supports data volume management, disks, and Network Attached Storage (NAS). Supports automatic log collection and integration with Log Service. 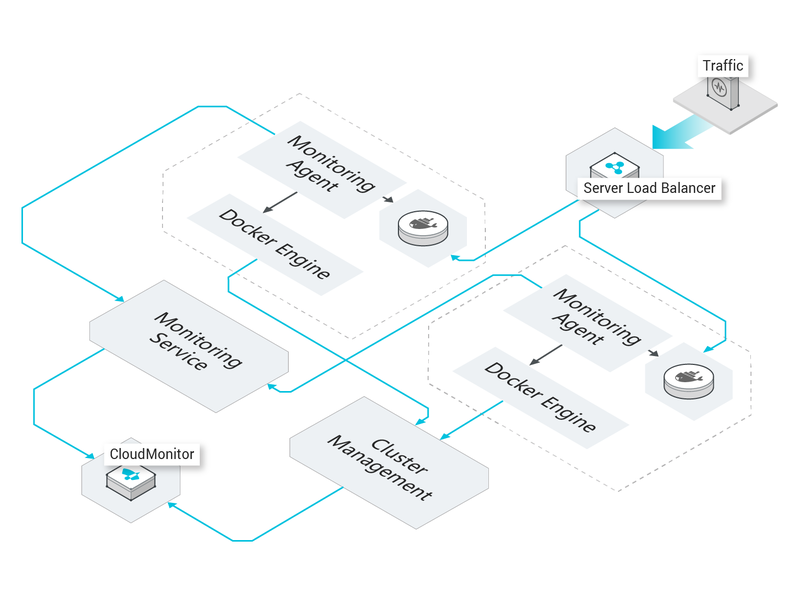 Supports both container-level and VM-level monitoring. Deploys applications in different zones to guarantee high availability. Avoids service downtime by rescheduling services on failed nodes. Forwards Layer-4 and Layer-7 requests and binds the requests to backend containers. Grants cluster operation permissions to RAM users. Container Service for Kubernetes is integrated with Virtual Private Cloud (VPC) and provides secure and high-performance deployment solutions that support hybrid cloud. This service is also integrated with Server Load Balancer (SLB) and allows you to leverage the capacity of multiple containers. Supports service affinity policies and horizontal service expansion. Deploys applications in different zones to guarantee high availability and disaster recovery. 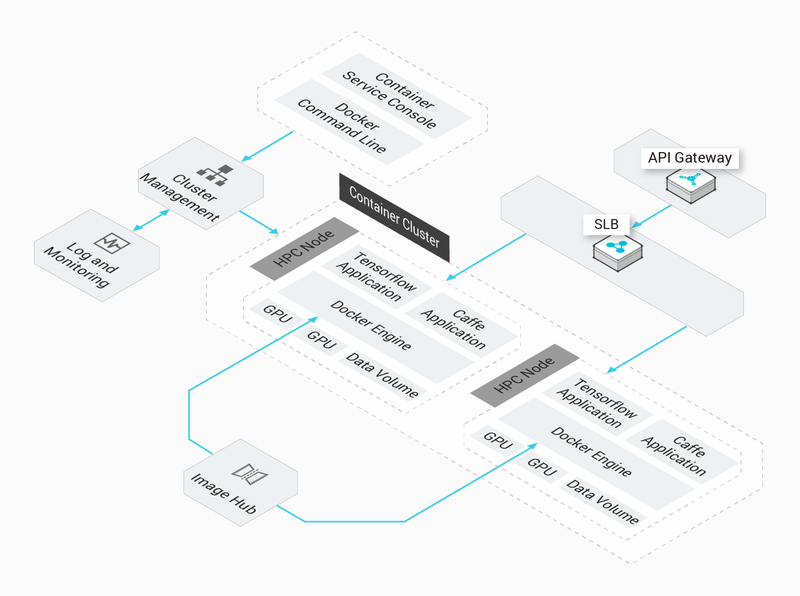 APIs are provided for cluster and application management. You can use these APIs in continuous integration and customized deployment. Container Service for Kubernetes and Jenkins can complete the DevOps process from code submission to application deployment with no need for manual operations. Only code that has been automatically tested can be delivered for deployment. This allows you to get rid of the traditional delivery modes that have complicated deployment and slow application iteration. Automates the DevOps procedure including code modification, code build creation, image build creation, and application deployment. Allows you to deliver not only the code but also the code running environment based on a fixed architecture. Sends immediate feedback on each integration or delivery. Focuses on machine learning and quickly deploys applications. Allows you to deploy machine learning applications on HPC clusters, track experiments, and train and publish models. Distributed data storage frees you from the deployment and operations of machine learning applications, so that you can focus on core business and deploy applications quickly. Enables quick deployment, startup, and auto scaling of machine learning applications. Allows you to obtain the GPU compute capabilities by simple configurations and monitor GPU resources. 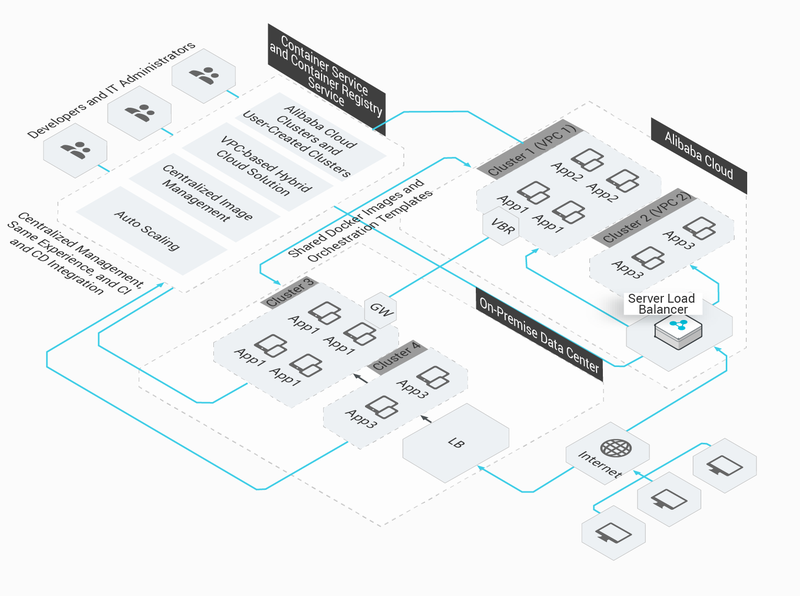 Seamlessly integrates with Alibaba Cloud capabilities, such as storage, logging and monitoring, and basic security architecture. Enables agile development and deployment, accelerating enterprise business iteration. Your business is divided into microservices in your enterprise production environment. These miscroservice applications are stored in Alibaba Cloud image repositories. 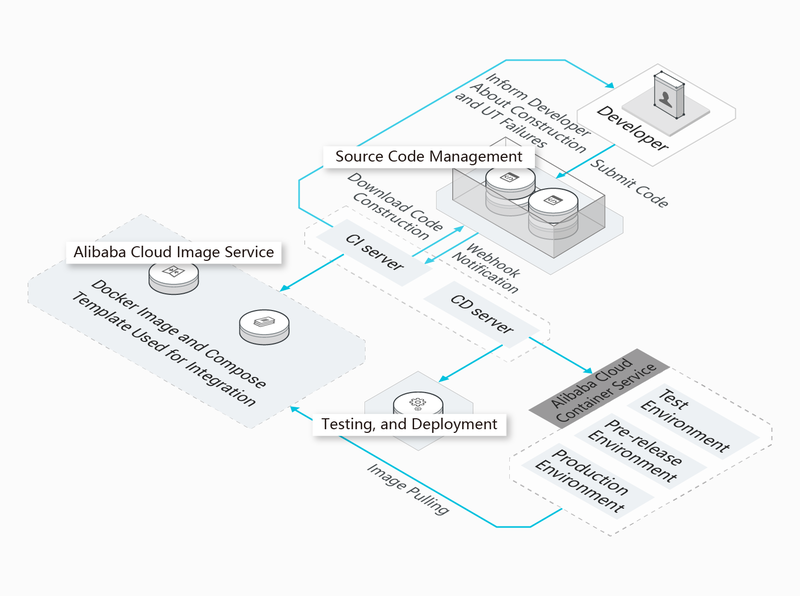 Alibaba Cloud can schedule, orchestrate, deploy, and grayscale-release the microservice applications, and you only need to iterate these applications. 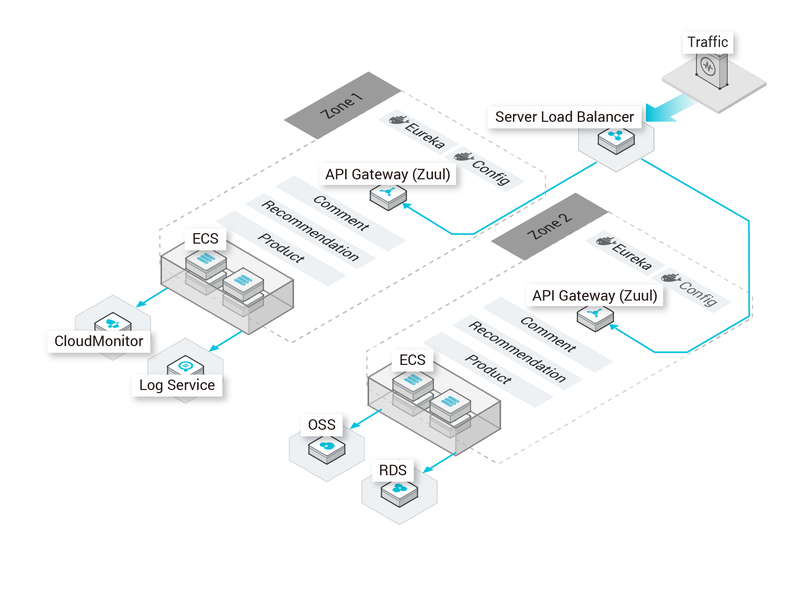 Supports service affinity scheduling, cross-zone application high availability and disaster recovery. Supports microservice and container monitoring, and microservice auto scaling. You can manage both cloud and on-premises resources in the Container Service console. Container Service for Kubernetes does not rely on specific infrastructure. Therefore, applications can be deployed both in the cloud and on-premises using the same images and orchestration plan. During peak hours, Container Service for Kubernetes can expand application capacities in the cloud and drive traffic to the cloud. Deploys business systems on-premises for service provisioning and in the cloud for disaster recovery. Applications that are on-premises developed and tested can be seamlessly released in the cloud. Container Service for Kubernetes enables business auto scaling based on traffic. This prevents traffic spikes from crashing your system and reduces the amount of idle resources. The container capacity expansion can be triggered within seconds after the business traffic has reached the threshold for capacity expansion. Manual operations are not required for capacity scaling. The container capacity automatically shrinks when the traffic reduces. This prevents wasting resources.